Christmas has come early to the house of Jinx this year. I don’t know exactly where it all started but I think it was when my Sister-in-law Katie said something on Facebook about putting up her tree already and it kind of snowballed from there. I mentioned to to Waldo and he said that it was a great idea to put the tree up now, that way we’d get more time to enjoy it. I told my Mother-in-law what we were planning and she loved the idea. 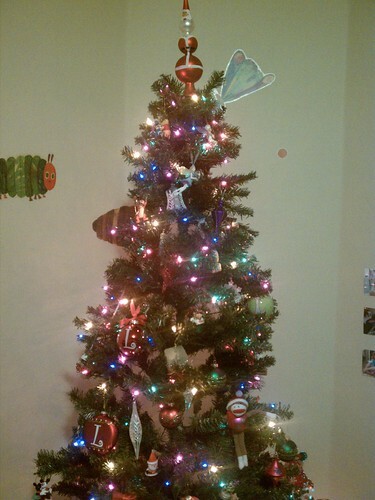 Now we have our tree up in our family room, my MIL has her tree up in the livingroom and Katie has all of her other decorations up (her house looks great) and her tree will be up any day now. The tree was just the beginning though. 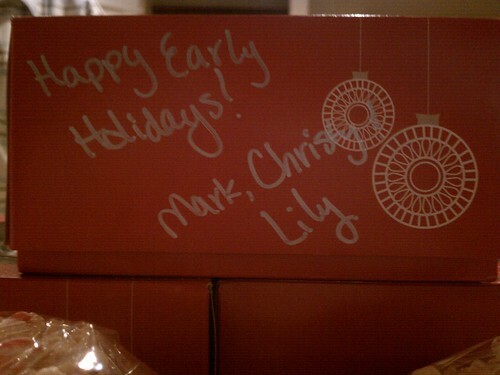 I’ve already spent one afternoon baking and gifted our new next door neighbor a lovely box full of Holiday Cheer. 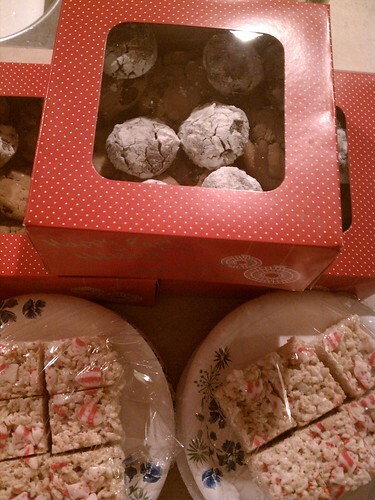 I made two different cookies and rice crispy treats all with a mint theme. 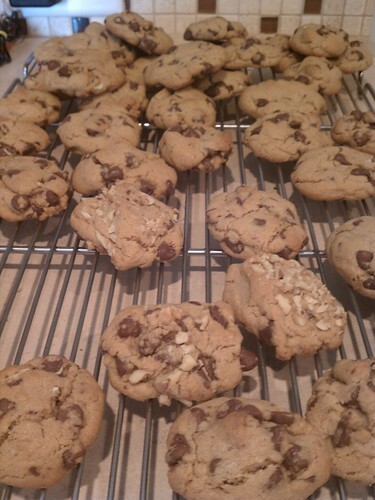 Here are my chocolate chip cookies with a hint of mint. I cut up Andes Mints for these. I also made Triple Chocolate and mint Crinkle cookies. I added chopped up Candy Cane Kisses and Andes Mints to the crinkle cookies. I can’t believe I didn’t get a picture of those. And now I can’t even find the recipe online. I got it from last December’s Food Network Magazine and it is amazing. 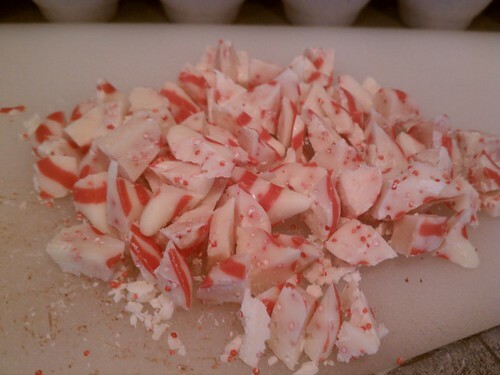 These are the chopped up Candy Cane Kisses that I put on top of the rice crispy treats. I loved them. Waldo informed me he’d rather have semi-sweet chocolate then white minty chocolate. All the sudden I have no idea who he is anymore. 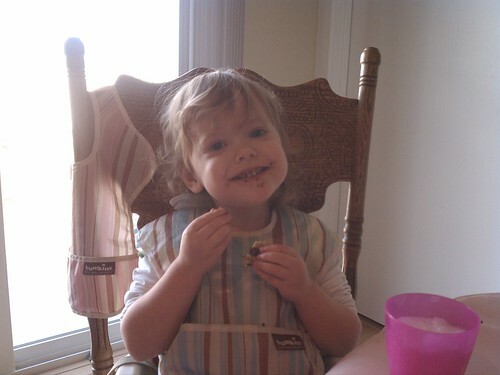 Lily got to enjoy a little cookie after her lunch and she thought it was the greatest thing EVER. Here are my finished packages. One to my Sister-in-law Katie and her family and the other two to neighbors. We tried to give the neighbor’s theirs tonight, but only one of them was home. We might be forced to eat the other box, you know I can’t give away 3 day old treats, it would do. Forced I say. Hey you can see the Triple Chocolate and Mint Crinkle Cookies in the box, they are covered in powered sugar. Yay I did sort of get a picture of them. Happy Early Holidays Everyone! Enjoy! All of these pictures were taken with my phone in less then stellar light. Sorry. This entry was posted in Food, Fun, Holidays, Lily, Us, Waldo and tagged food, Fun, Holidays, Lil, Waldo.